Who killed JFK? And why did they do it? John F. Kennedy was assassinated on November 22, 1963 by way of a classic, execution-style ritual sacrifice known as the “killing of the King”*. This form of unusually public and gruesome murder of an extremely popular world leader is designed to shock and awe the mass consciousness. And so it did. JFK was by far the most courageous and self-sacrificing president in modern American history. In his almost 3 year tenure, he made more bold decisions, issued more audacious executive orders, and enacted more revolutionary policy than all of the other US presidents of the 20th century put together. How so, you might ask? Therefore, the real question is how JFK managed to survive as long as he did. (1) JFK issued executive order # 11110 which essentially disempowered the Federal Reserve System. This international crime syndicate is a private banking cartel with no reserves and is not federal, since its owners are more foreign than domestic. Like President Andrew Jackson, he knew the FED had to go if there was to be freedom from permanent debt slavery for the USA. Needless to say, the NWO bankers would not tolerate such audacity, and JFK knew he would pay the greatest price. (2) JFK vowed to shut down the CIA shortly after the failed Bay of Pigs operation. The CIA is the granddaddy of all black ops and psyops around the world, including all major terrorist events before and since 911. With such an enormous and unaccountable black budget funding so many illegal schemes, JFK understood the CIA was the proverbial loose canon. His firing of CIA Director, Allen Dulles, proved to be the last straw. So was his vow to “splinter the CIA into a thousand pieces and scatter it into the winds”. (3) JFK was implementing plans to end the Viet Nam War. His failure to prosecute the war greatly irked the Roman Catholic Church, the war’s primary instigator. As the first Roman Catholic US president, he made it clear during his campaign that he would act with complete independence from Vatican influence and always govern as his conscience dictated. Terminating the Viet Nam War became JFK’s number one foreign policy agenda item, which put him at serious odds with the entire World Shadow Government. (4) JFK adamantly opposed Israel’s plan to develop nuclear weapons. His uncompromising posture enraged Israeli Prime Minister David Ben Gurion, and brought upon him the wrath of the MOSSAD. A nuclear-armed Israel was an essential goal of those who would control the oil and gas reserves throughout the Middle East. JFK was well aware of Israel’s intentions to terrorize the entire Middle East with threats of nuclear armageddon. (5) JFK was proceeding with plans to reveal highly classified information regarding the truth about UFO’s and the Alien Presence on Planet Earth. “He was the only member of Majestic 12 that wanted full disclosure to the American people.” That Extraterrestrial Biological Entities existed fascinated JFK, and he felt the nation had a right to know. Such revelations would never be allowed by those who control the mainstream media and dictate world governance. (6) JFK issued a direct warning to all Secret Societies operating on US soil. The Illuminati was not pleased! By taking concrete measures to expose their secret agendas and clandestine operations, he put himself at great risk and his entire Administration in serious jeopardy. Nevertheless, JFK knew that his unprecedented revelations in this regard sealed his fate. It has even been asserted that he went to Dallas having been fully forewarned of the murder plot. Furthermore, he knew he was powerless to prevent a covert coup d’etat engineered and executed by the secret societies. (7) JFK’s brother and US Attorney General, Robert F. Kennedy, launched an unprecedented war on organized crime, and particularly against the NYC, New Orleans and Chicago mob families. Obviously the American Mafia was not pleased, especially after they allegedly helped swing the necessary Chicago vote (and therefore Illinois electoral votes) in JFK’s favor to win the election. Bobby, himself, admitted that his aggressive pursuit of the mob may have caused the demise of his brother. (8) JFK inherited the most intense foreign policy hotspot known as Cuba, as well as the CIA’s intention to assassinate Fidel Castro. The Cuban Missile Crisis had broad ramifications for his presidency, as well as for the Cold War. His decision-making independence throughout the crisis, especially his use of personal surrogates and unconventional process, would not be tolerated. However, it was the Bay of Pigs (BOP) fiasco and the withdrawal of Air Force support from the operation which turned the CIA against him for good. (9) JFK took up the torch of civil rights in a way that no other President did throughout the 20th century. His embrace of the Civil Rights Movement drew close to him many who would try to sabotage his efforts “by all means necessary”. As the Great White Hope, JFK (and RFK) were considered to be a threat to those who would divide and rule through stoking racial hatreds. The Deep South was therefore a conducive environment to stage the assassination, just as southerners murdered Abraham Lincoln post Civil War. (10) JFK had very serious and powerful enemies in the form of Lyndon B. Johnson, George H. W. Bush, Richard N. Nixon, J. Edgar Hoover, Allen Dulles, Dean Acheson, as well as the British Crown whose intentions were well known by his ambassador father, Joseph P. Kennedy. The entire global power structure, particularly the US Military-Industrial Complex, and its many secret societies and covert organizations, were vastly arrayed against him. The World Shadow Government was determined to make an [UNFORGETTABLE] example of him. There is no question that the corporate-sponsored war instigated in Viet Nam would not be stopped by a peace-loving president who learned from his experiences in WWII. The global Military-Industrial Complex (MIC) already implemented its agenda ensuring perpetual war. However, Kennedy wanted no part of it, but seems to have neglected to see that his Texas-bred Vice-President was one of the prime political movers behind that agenda. This was perhaps the most fateful compromise of JFK’s career. He knew that he could not win the election without LBJ. He also knew that his presidential platform was quite incompatible with virtually everything LBJ stood for. After all, LBJ’s Texas political machine was well oiled by Big Oil and generously funded by the very MIC corporations that thrived on war. The obvious upshot* is just that. 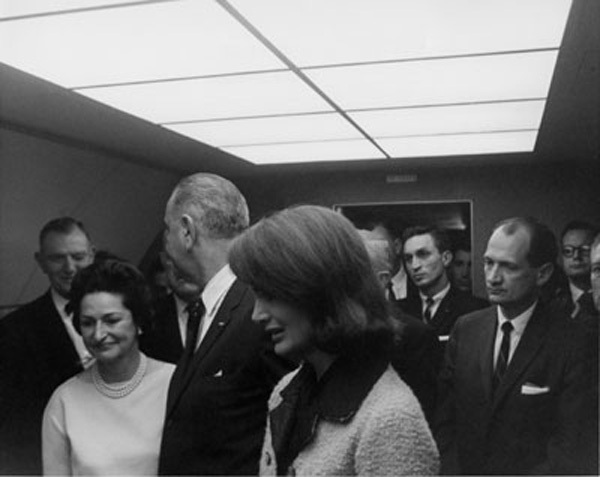 Because of his strategic position in the Vice-Presidential suite, LBJ was able to set up the final shot of the Kennedy’s term in office. As a matter of fact, the following exposé shows just how confident they were in their plan to remove a US President by way of public execution — Texas-style. As you can plainly see, JFK could have easily been assassinated for any ONE of these ten reasons. Each one carries with it grave consequences, so its very easy to understand why “he had to go”, as far as TPTB (The Powers That Be) were concerned. Therefore, it takes only a small leap of understanding to apprehend the extraordinary and complex conspiracy, that was coordinated at the very highest levels of government and power both in the USA and the world-at-large, which ensured his demise in the form of a public execution and ritual sacrifice. So let’s put to sleep this whole notion of conspiracy once and for all. It’s not that thousands of individuals and groups were directly involved with the actual assassination itself. However, and without question, these numerous organizations were involved obliquely in a cover-up of incomprehensible size and scope. Especially by putting their vast resources in the service of the ongoing and necessary conspiracy of silence, was an extremely well coordinated cover-up ever successfully conducted. In a highly compartmentalized black operation like this one was, where every perpetrator participated on a strictly need-to-know basis, it is easy to see how they pulled it off. By acts of omission, and silence, and a knowing wink* like LBJ’s captured during his swearing in ceremony were they successful in carrying out the most shocking and horrifying coup d’etat of the 20th century. LBJ returning a knowing wink to Texas cohort, Congressman Albert Thomas during his swearing-in ceremony aboard Air Force One. By acting as a truly righteous and just leader, JFK made so many enemies that his assassination was all but a forgone conclusion, and therefore just a matter of “execution”. However, what the TPTB failed to realize, was that a self sacrifice on the order of JFK’s would produce a whole generation of anti-war activists who literally shut down the Viet Nam War – an unprecedented act of defiance in American history. This galvanization of moral ascendancy through the peace movements of the 1960’s & 70’s is perhaps the only time in recorded history that a popular movement was successful at bringing a war machine to a screeching halt! 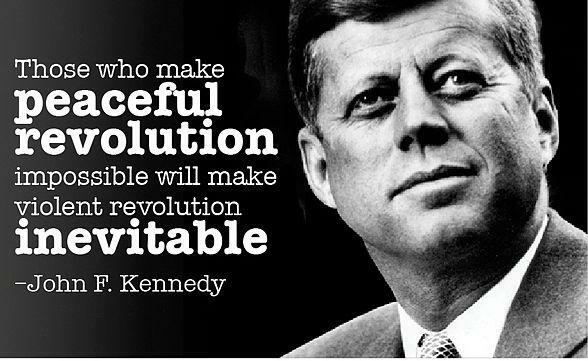 Because of the extraordinary, enlightening and edifying effects that John F. Kennedy had on the American consciousness, TPTB must have determined that they had no choice but to kill the messenger. JFK’s message of peace and brotherhood and good will was simply too contrary to their agenda. As a “pitchman for peace”, he was far too effective in delivering a message of hope to the entire world. His sincerity was further evidenced by his intention to wind down the Viet Nam War against the wishes of a burgeoning military industrial complex which had never before been thwarted. That such a power exists which can execute a US President in broad daylight with absolute impunity. And that cover-ups of such a serious crime and conspiracy are as easy as fabricating a new JFK assassination conspiracy theory every other year. However, TPTB failed to realize that there were so many involved in this cover-up that the truth would be revealed sooner or later. And so it has. Here’s just one little video that will forever provide a photo-documentary of highly incriminating actions perpetrated by JFK’s Secret Service detail as his motorcade began its journey through Dallas on November 22, 1963. That there was an entire “system” dedicated to JFK’s demise once he revealed his true agenda is now without question. Whereas TPTB were completely committed to perpetual war, economic exploitation, and divide and rule, John F. Kennedy was genuinely dedicated to world peace, economic justice, and social equality. For the many Beatniks and Baby Boomers who ‘witnessed’ the JFK assassination by being innocently attentive to the evolving saga, something very profound and “earth-shattering” took place. Even though this meticulously planned murder and cover-up conspiracy was obviously orchestrated by those various interested parties outlined above, it was an event which was pre-ordained by the Highest Power. Its profound and far-reaching repercussions served to catalyze the most consequential shift in American consciousness ever to occur. Millions of disaffected youth and young adults were compelled to “leave the reservation”, and unshackle themselves from the quickly emerging Consumer Society. The resulting and unprecedented spiritual diaspora sent truth seekers to the East in search of meaning, in a quest to know life’s purpose, and in the ultimate pursuit of Truth. 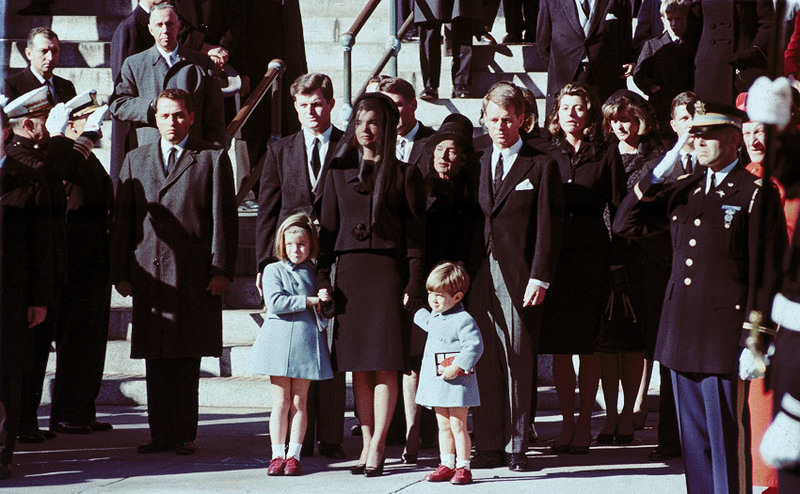 May the spirit of JFK live on in the hearts of all of US. rise up and demand an end to war … all war, everywhere.